Hidden in a basement in St Stephen’s Street this little restaurant is a real treat, but make sure you’re good and hungry before you go because there are little extras along the way. 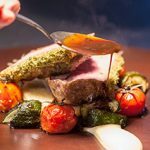 The head chef at Purslane, Paul Gunning, trained with some truly first class chefs and this shines through every morsel of food he prepares from the first bite. We can’t call writing a Purslane review work – the experience was a delight from beginning to end. Once we’d settled into our seats and ordered our wine we were offered an amuse bouche to really whet our palettes. As a starter I chose the perfectly seared scallops with a watercress purée, roasted celeriac and samphire a delight to the eye as well as the mouth. My dining partner, who’s a vegetrian, had a chicory tart tatin with a red pepper and shallot dressing. Chicory can be quite a bitter leaf, but the red pepper and shallots balanced out the flavour beautifully. I was obviously in the mood for seafood and chose the monkfish as a starter. This is a fish which can easily become very tough, but as you’d expect from such an experienced chef, the fish was firm but moist with not even a hint of rubberiness. My vegetarian companion chose the butternut squash risotto. She spends hours in her own kitchen lovingly preparing one of the best risottos I’ve eaten so I was interested to hear her opinion. The dish was thick and creamy, beautifully seasoned and the pine nuts added the textural element that risotto so often cries out for. According to my friend, a masterpiece! This Purslane review doesn’t cover the sweet stuff, as pudding was a step too far for us, although it sounded (and having had a good old nosey at other people’s tables it also looked) amazing, so we settled for a cup of coffee and petits fours. The coffee was strong and cut perfectly through the silky smooth richness of the petits fours. We’ve long raved about Purslane and everybody we’ve recommended it to has absolutely loved it!